Since I find that tights are such a great addition to my wardrobe, I own a lot of them! I have tights of various colours like burgundy and navy, as well as tights of different prints and styles. If you own a lot of tights like me, you may have noticed that they often look different and vary in length, and size. 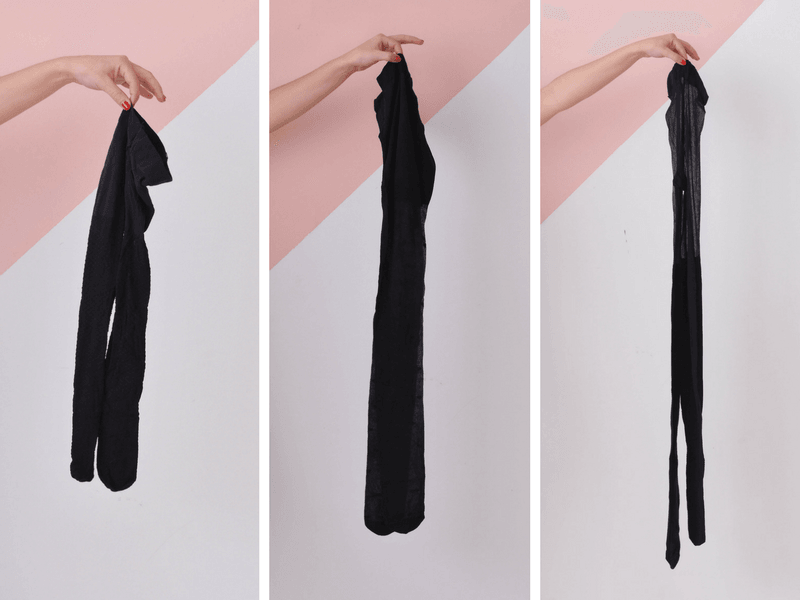 When you remove a pair of tights from their packaging, sometimes they can appear to be too small or too large due to their length and width. The reason being that tights come in a range of materials, which can alter their appearances. Tights are an elastic product, which can be made of different yarns and yarn combinations. As a result, separate styles can look different when they are simply laid down on a table. But tights have the ability to stretch and mold to your shape and should never be measured or compared by simply looking at them. You should always consult a company’s size chart before buying a pair of tights. If you followed the size chart correctly, no matter how big or small your tights may appear, you probably have the right size in hand. Go ahead and give them a try. If you don’t believe me, I enlisted my friend Jennifer to do a size test and try tights of various materials and compositions to see how they fit. No matter their appearance, all these tights are a size medium and should properly fit Jennifer. Let’s find out if that’s true! Watch how these tights stretch and mold to your shape! Appearance: These tights appear large. Before you put them on, they may even seem longer than your actual legs! But true to the size guide, size medium fits Jennifer well. Appearance: These tights look super small, but stretch immensely and are still comfortable. A medium is still the right size for Jennifer. Appearance: These tights look like an average size and in fact, a medium still fits Jennifer well. If you’re not sure what size tights you should buy, read this article to learn everything you need to know to choose the right size tights. Do you have any questions about the size of your tights? Comment below to let me know!